I love the name of honour, more than I fear death. Gaius Julius Caesar was a statesman, general and author of many works. He was largely responsible for the transition from Republic to Empire in Rome. He built his power base through military success, extending Rome’s territory into Gaul, crossing the Rhine to dominate many Germanic tribes and carrying out the first invasion of Britain. When the Senate demanded he give up his military command and return to Rome, Caesar refused, marshalled his loyal legions and crossed the Rubicon river, plunging Rome into civil war. By the end, he had emerged victorious, only to be murdered by his fellows. 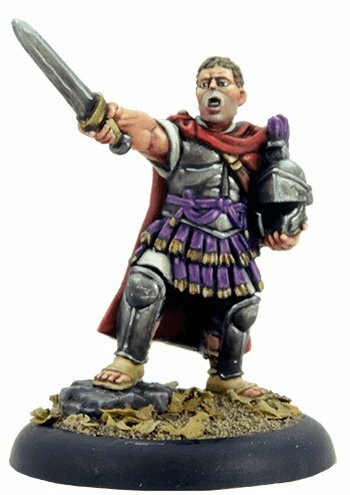 Our depiction of Caesar is of a battlefield leader, perhaps amongst his loyal Tenth Legion, leading from the front against those who would seek to prevent his climb to power. Veni, Vidi, Vici. 28mm sized limited edition metal figure, supplied unpainted.